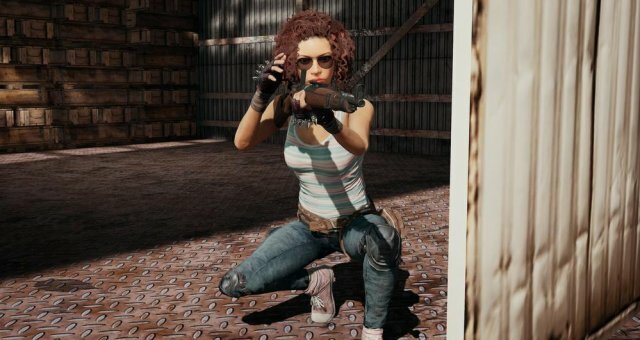 Hints for every achievement in PUBG. Survival Tips & Tricks (Guide to Chicken Dinner). Best Loot and Spawn Locations (Vehicles, Boats, Callouts). How to Get Blue Blood. Bugged achievements: Some achievements register a kill as being 2 kills. Achievement progress can take minutes to update, and sometimes not register progress in some cases. After you meet requirements of an achievement you should be able to exit to lobby and have the achievement progress still register. 12.1% of players have this achievement. Carry an assault rifle, SMG, and pistol. Eventually you'll come across a suppressor, then simply use that weapon to get kills. You can prey on the disconnected players in squad matches, as there's usually atleast 1 squad that disconnects before the match starts. At the start of the match stay in the plane until it kicks you out, then follow the disconnected players to note where they land, then loot around until you find a suppressor and matching weapon, and return to the AFK players to kill them with it. It's best to do this on Miramar where they won't end up drowning in the sea. 37.6% of players have this achievement. You should be able to exit the match and return to the game lobby after hitting the ground and looting a few items to quickly progress on this achievement and earn some BP each time. 71.5% of players have this achievement. If you're struggling to get kills then prey on the disconnected players in squad matches, as there's usually atleast 1 squad that disconnects before the match starts. At the start of the match stay in the plane until it kicks you out, then follow the disconnected players to find where they land and kill them. It's best to do this on Miramar where they won't end up drowning in the sea. 42.1% of players have this achievement. 28.3% of players have this achievement. SMGs are a strong weapon to carry alongside an assault rifle or sniper. Stick to close-range areas and take on your opponents with the SMG unless you have to defend yourself at longer ranges with your rifle. Dropping at school and fighting over and over again is one way to get this achievement, or if you're struggling to get kills then prey on disconnected players in squad matches, as there's usually atleast 1 squad that disconnects before the match starts. At the start of the match stay in the plane until it kicks you out, then follow the disconnected players to find where they land. Remember where they landed, then find a shotgun, a submachine gun, or a pistol and return to shoot them. It's best to do this on Miramar where they won't end up drowning in the sea. 6.0% of players have this achievement. 50.7% of players have this achievement. 18.2% of players have this achievement. Land where you think other players will be trying to get vehicles, likes forks in major roads. If you land at a vehicle then wait for a player to get in first, then get in it yourself. It might take a while for the achievement to register, so stay in the vehicle atleast until it does. Note that if you're in the vehicle first then the achievement probably won't work. 63.4% of players have this achievement. 10.3% of players have this achievement. It generally takes 2 hits to kill a player with a pan. This can be difficult, so consider keeping a pan on you and playing squad matches, then when you come across a knocked-down player simply finish them off with the pan. You can also prey on the disconnected players in squad matches, as there's usually atleast 1 squad that disconnects before the match starts. At the start of the match stay in the plane until it kicks you out, then follow the disconnected players to note where they land, then loot around until you find a pan and return to the AFK players to kill them with it. It's best to do this on Miramar where they won't end up drowning in the sea. 30.0% of players have this achievement. A strong strategy can be to get a vehicle and drive away from the path of the plane and loot up for the end of the match. Study the vehicle spawn points, avoid players, and use as much teamwork as you can. The vehicle is important to drive to high value positions and outrun the blue zone, otherwise you'll find yourself running through open ground being chased by the edge of the circle. 44.5% of players have this achievement. 5.5% of players have this achievement. The easiest way is probably running over disconnected players in squad matches, as there's usually atleast 1 squad that disconnects before the match starts.At the start of the match stay in the plane until it kicks you out, then follow the disconnected players to find where they land. If they landed at a point where you can reach them with a vehicle, then find a vehicle to return to where they landed to run them over. It's best to do this on Miramar where they won't end up drowning in the sea. Another method is to run over players that are trying to get vehicles at the start of matches, but you'd have to make sure you got the vehicle first. 35.6% of players have this achievement. Drop early from the plane, if not as soon as it allows you to. Go wherever a player and loot might be. If you don't the first kill then loot a couple of items and exit to lobby so you atleast get some BP while attempting this achievement. 15.9% of players have this achievement. Each airdrop has a few items in it, so you won't need to reach too many of them. Just make sure that you're the first one there, although there's often a leftover item in old airdrops. Vehicles are important to reach airdrops quickly, so aim to always get a vehicle if possible. 0.1% of players have this achievement. Ironically I think this is one of the easier achievements. You can change seats while in a vehicle. Find a vehicle(I like to spot them while I'm on the parachute), then drive it to some loot to find a gun. Now drive over to a player and swap seats to shoot them from that seat. If you're in a 3-seater bike then switch to the sidecar so you can use weapons properly, as the back seat limits your weapons. The easy way to get the achivement is to kill disconnected players in squad matches, as there's usually atleast 1 squad that disconnects before the match starts. At the start of the match stay in the plane until it kicks you out, then follow the disconnected players to find where they land. If they landed at a point where you can reach them with a vehicle, then find a vehicle and guns to return to where they landed to park by them and switch seats to shoot them. It's best to do this on Miramar where they won't end up drowning in the sea. Another method is to park a vehicle from a nice position and try to snipe from one of the seats. Killing players from a moving vehicle isn't impossible, but it's the most difficult way to get the achievement. 9.5% of players have this achievement. Don't stress this achievement, it just takes time. Simply pick up weapons and suppressors as you find them and eventually you'll get all 3 in one match. You can try moving away from the path of the plane and focus on looting away from planes for as long as possible in the match. 62.4% of players have this achievement. Play a squad match and stay close to your teammates. If you can loot a smoke grenade, throw it at your downed teammate to help obscure the revive attempt. 58.5% of players have this achievement. Loot around until you find an energy drink and a painkiller, then use them quickly one after the other. Using 3 energy drinks, or 2 painkillers might also work. 53.1% of players have this achievement. If you're struggling to get kills then prey on disconnected players. If you're lucky then there might be an entire squad that disconnected. See the disconnected players section at the top of this guide. Alternatively, try to find a decent weapon and a good position to shoot players as they're pushed into open ground when the blue zone is arriving. 14.3% of players have this achievement. You're more likely to win squad matches(4 players out of 99 can win a squad match, while only 1 out of 99 can win a solo match) but if you have one good teammate then consider playing duos with them, as you'll only ever face enemy duos. If you play in squads then you might face against a team of 4 skilled opponents at a time. If you're skilled then you can try solo matches, but when there's only 1 winner out of 99 players you have mathematically less of a chance at winning. 5.9% of players have this achievement. If you're struggling for kills then you can prey on the disconnected players in squad matches, as there's usually atleast 1 squad that disconnects before the match starts. At the start of the match stay in the plane until it kicks you out, then follow the disconnected players to find where they land and punch them to death. It's best to do this on Miramar where they won't end up drowning in the sea. If that's too boring then simply drop at popular places on the map and focus on fighting in every match. 44.4% of players have this achievement. The M16 and AKM are commonly found throughout the map and will work with this achievement. If you're struggling to get kills then prey on disconnected players. Remember where they dropped at the end of the plane, then find a rifle/sniper and return to kill them, but remember to do it from some distance away. 27.1% of players have this achievement. 55.5% of players have this achievement. 3.6% of players have this achievement. Knock-downs don't count towards the achievement, so one method is to grenade players in solo matches. Another method is to grenade downed players in duo/squad matches. The easiest method would be to grenade disconnected players. You can prey on the disconnected players in squad matches, as there's usually atleast 1 squad that disconnects before the match starts. At the start of the match stay in the plane until it kicks you out, then follow the disconnected players to note where they land. It's best to do this on Miramar where they won't end up drowning in the sea. Note where they landed, then try to loot frag grenades and return to kill them before the blue zone arrives to kill them. Make sure you knock them down before using the frag grenade, as knock-downs don't count. 1.3% of players have this achievement. 15.1% of players have this achievement. 38.9% of players have this achievement. Some dead players might have a ghillie suit you can loot, otherwise try to be the first one to reach an airdrop. Having a vehicle is critical to reaching airdrops, so get a vehicle and drive around keeping an eye out for planes. You might have to wear the ghillie suit for a minute until the achievement registers, so try to stay alive with it for a minute after looting one. 14.1% of players have this achievement. Looting other players can be a good strategy for this achivement, as towards the end of the match you'll often find dead players that have level 3 items. At the time of writing the achievement - airdrops have all the level 3 parts you need, so consider finding a vehicle and driving around chasing airdrops to loot them. 62.2% of players have this achievement. Remember the path of the plane and move far away from it. If the plane is close to one side of the map, then drop to the opposite side to give yourself as much free space as possible. Skulk around, and consider wearing your most camouflaged clothing skins. 0.3% of players have this achievement. Find a crossbow and get used to the flight path of the bolts, as they don't fly straight. They sometimes kill in one hit, and sometimes the hits don't seem to register. One method is to kill disconnected players in squad matches, as there's usually atleast 1 squad that disconnects before the match starts. At the start of the match stay in the plane until it kicks you out, then follow the disconnected players to find where they land. Loot to find a crossbow and make sure to take the ammunition for it, then return to where they landed to shoot them with the crossbow. It's best to do this on Miramar where they won't end up drowning in the sea. Knock-downs don't count towards the achievement, so if you're in a duo/squads match then you can try knocking down the player before finishing them with a crossbow. If you've got enough bolts then just use the bolts instead, as they might be the last of their squad or playing solo and would die outright rather than get knocked down. 7.4% of players have this achievement. If you're struggling to get this achievement then you can prey on the disconnected players in squad matches, as there's usually atleast 1 squad that disconnects before the match starts. At the start of the match stay in the plane until it kicks you out, then follow the disconnected players to find where they land and punch them to death. It's best to do this on Miramar where they won't end up drowning in the sea. Another method is to play in squad matches and when you come across a knocked-out player get your fists up to finish them off with punches. 48.4% of players have this achievement. A large part of reaching the top 10 can be through avoiding players until the end. Remember the path of the plane and move far away from it. If the plane is close to one side of the map, then drop to the opposite side to give yourself as much free space as possible. Skulk around, and consider wearing your most camouflaged clothing skins. 18.9% of players have this achievement. If you hit a player multiple times then the kill won't count for this achievement, so you need to kill them in one hit. It also doesn't count if you just knock them down. It's unlikely that you'd get this achievement with anything other than the K98, M24, or AWM because you can't one-shot someone wearing helmets with weaker sniper rifles. One method is to play on Miramar and drop at the end of the plane to note where the disconnected players landed, then find a sniper so you can come back and headshot them. The key is that disconnected players don't have helmets so you can easily 1-shot them, and on Miramar the disconnected players probably won't land in water and drown. 20.1% of players have this achievement. A strong strategy can be to get a vehicle and drive away from the path of the plane and loot up for the end of the match. Study the vehicle spawn points, and avoid players early on. You can't win the match early on, but you can lose it. The vehicle is important to drive to high value positions and outrun the blue zone, otherwise you'll find yourself running through open ground being chased by the edge of the circle. Eventually you'll have some luck on your side and get an opportunity to win. 56.0% of players have this achievement. Loot the box of a dead player and wear their clothing. The achievement may take awhile to register. You may have to wear the clothing for some time before it registers.